Rio Grande’s Jasmine Smith gets off a shot around Alice Lloyd’s Alex Clifton during Sunday afternoon’s game at the Newt Oliver Arena. Smith scored a game-high 18 points in the RedStorm’s 78-71 win over the Eagles. 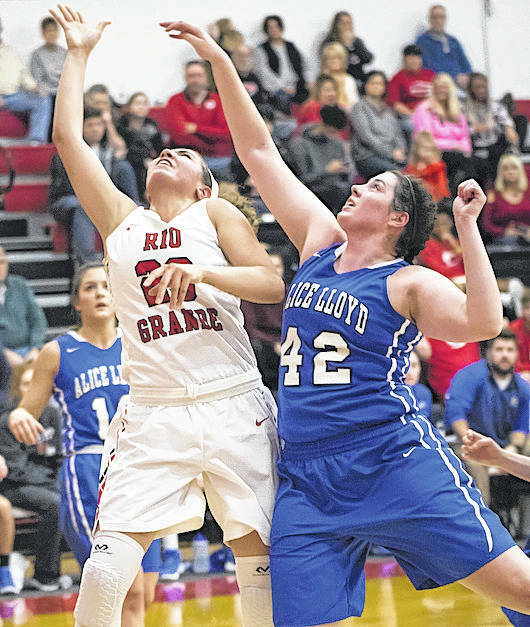 RIO GRANDE, Ohio — Blown leads have been as rare as a sighting of Halley’s Comet for the University of Rio Grande women’s basketball team during its record-setting winning streak. But a blown lead was exactly what the RedStorm was forced to overcome on Sunday afternoon. Head coach David Smalley’s club coughed up an 11-point first half lead before mounting a fourth quarter rally to outlast Alice Lloyd College, 78-71, in a battle of River States Conference division leaders at the Newt Oliver Arena. Rio Grande, which is ranked No. 21 in the latest NAIA Division II coaches’ poll, won for a 19th straight time to run its record to 21-1 overall and 9-0 in conference play. The RedStorm holds a commanding three-game lead over both WVU-Tech and Point Park in the RSC East Division. Alice Lloyd slipped to 13-3 overall and 7-2 in the RSC with the loss. The Eagles saw their lead over Indiana University Kokomo in the league’s West Division sliced to one game. Rio Grande led 31-20 after a bucket by sophomore Sydney Holden (Wheelersburg, OH) with 4:36 left in the first half, but the Eagles whittled their deficit down to eight points at halftime and eventually grabbed a 43-42 lead following a jumper by Shelby Davis with 5:11 remaining in the third quarter. Alice Lloyd eventually extended its advantage to 58-53 after an Alex Clifton jumper with 1:20 left in the third quarter, but the RedStorm responded with a 9-0 run over the next 3:48 to regain a 62-58 cushion following a layup by junior Jaida Carter (New Philadelphia, OH) with 7:32 left in the contest. The Eagles managed to tie the game twice more at 65-65 and 67-67, but a three-pointer by Holden with 2:38 remaining put Rio in front, 70-67, and gave the RedStorm a lead they wouldn’t relinquish. Holden’s trifecta kickstarted an 11-4 game-ending run. Junior Jasmine Smith (Canal Winchester, OH) led a quartet of double-digit scorers for Rio Grande with 18 points, while Holden finished with 16 points, 10 rebounds and a team-best three assists. Senior Alexis Payne (Deep Water, WV) added 14 points and Carter tallied 10 points and a career-high 11 rebounds in the winning effort. Holden, Smith and Payne also had two blocked shots each and freshman Chyna Chambers (Columbus, OH) had a game-high four steals. Clifton had 16 points and nine rebounds to lead Alice Lloyd, while Haley Hall had 16 points of her own and Kayla Wilson finished with 15 points, seven rebounds, five assists and four steals. The game, which featured six ties and five lead changes, was marred by 49 personal fouls and 57 combined free throw attempts. Rio Grande shot just 29.4 percent from the field (10-for-34) in the second half and finished 24-for-67 (35.8 percent) for the game. Alice Lloyd connected on just 31.6 percent (12-for-38) of its shots in the first half and finished at 36.6 percent (26-for-71) for the game. Rio Grande returns to action on Tuesday night when it travels to Asbury University for another RSC contest.